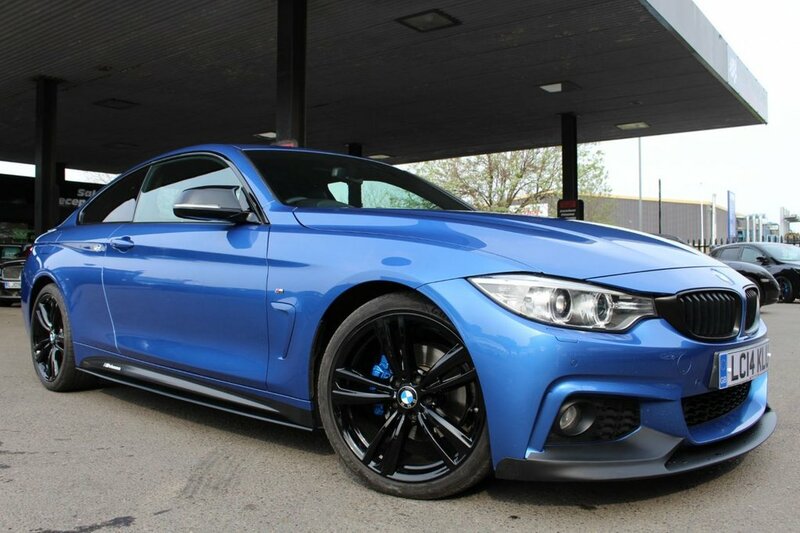 HERE WE HAVE A STUNNING LOOKING BMW 420 D M SPORT FINISHED IN ESTORIL BLUE WITH SOME GREAT M PERFORMANCE UPGRADES INCLUDING; CARBON FIBRE M PERFORMANCE SIDE SKIRT DECALS, MATTE BLACK KIDNEY FRONT GRILLES, MATTE BLACK FRONT SPLITTER, ,MATTE BLACK REAR DIFFUSER, CARBON FIBRE BOOT LIP, FULL SCREEN SAT NAV, FULL DAKOTA BLACK LEATHER SEATS, HEATED SEATS, DUAL DIGITAL CLIMATE CONTROL, CRUISE CONTROL, BLUETOOTH HANDS-FREE CONNECTION, BLUETOOTH AUDIO STREAMING, DAB DIGITAL RADIO, AUX CONNECTION, FRONT AND REAR OPTICAL AND AUDIO PARKING SENSORS, AUTOMATIC XENON HEADLIGHTS WITH LED DAYTIME RUNNING LIGHTS, LED REAR LIGHTS, 19" GLOSS BLACK ALLOYS, KEYLESS START, AUTOMATIC STOP/START TECHNOLOGY, SPORT AND ECO PRO MODE, LEATHER MULTIFUNCTIONAL STEERING WHEEL WITH PADDLE-SHIFT GEAR CHANGE !! FULL SERVICE HISTORY CARRIED OUT AT 21198 miles, 43297 miles, 61467 miles, 77542 miles AND THEN FINALLY AT 95230 miles. THE CURRENT MILEAGE IS NOW 95327 miles. MOT UNTIL 15th APRIL 2020.